George Town on the Malaysian island of Penang is a tourist magnet. Thanks to Instagram, the 3-D street art in the city by Lithuanian artist Ernest Zacharevic is famous. But not all artists are happy about it. Two children are on a bicycle: the little boy is perched on the luggage rack, clinging shouting, to his big sister, who is obviously having a lot of fun. The picture on a house wall in George Town, on the Malaysian island of Penang, is a tourist magnet. 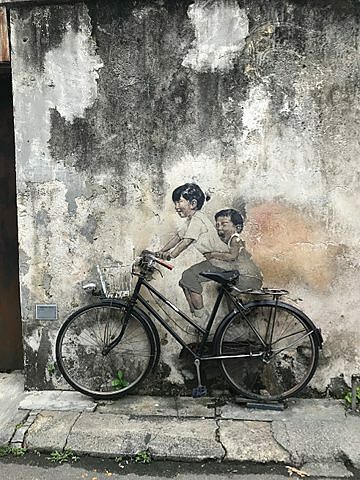 The special thing about it is that the bike is real, while the children are painted almost photo-realistically on the mottled wall behind it: 3-D street art. The work of art is one of the most reproduced and photographed street art works in George Town. And it’s made the little Asian island famous for its street art. But not all artists are happy about it. 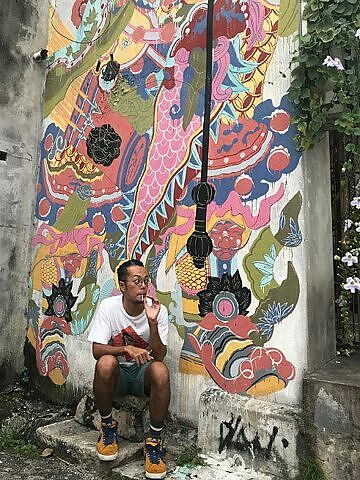 Bibichun, in his mid-thirties, is a street artist from Malaysia who has lived in George Town on Penang Island for five years. When Bibichun came to George Town, Lithuanian artist Ernest Zacharevic had just completed several street art works in the old town for an art festival. Zacharevic had tried something new: he integrated real objects like a bicycle into his photo-realistic, painted murals. Tourists sit on the bike or pose next to it and become part of the scene. 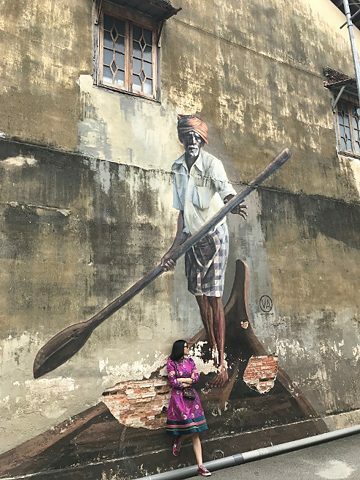 Thanks to Instagram and clever city marketing, this work of art became so famous within just a few months that George Town is not only known today as a Sino-British colonial town and UNESCO World Heritage Site, but as THE city of street art in Southeast Asia. Zacharevic became the superstar of the scene. Cora Knoblauch posing with “Boy on Motorcycle” to become part of the scene. “Kids on Bicycle” made Ernest Zacharevic famous. For tourists Zacharevic's street art is a popular scene on instagram. Street artist Bibichun in front of his work. It’s much easier for foreign artists to get commissions in Malaysia, he says. Bibichun makes his living from commissioned works. His non-commissioned street art usually lasts only a few weeks, sometimes only days. Then his pictures are painted over by the city, mostly because they violate censorship laws. Even Zacharevic’s children on the bike are fading. The tropical, humid climate of Malaysia makes the art and the walls mouldy. If George Town doesn’t invest more in preserving its street art, some pictures will only survive on Instagram and on the tourists’ smartphones. Cora Knoblauch, from Berlin’s radioeins, is a guest journalist with Radio BFM 89,9 for three weeks. 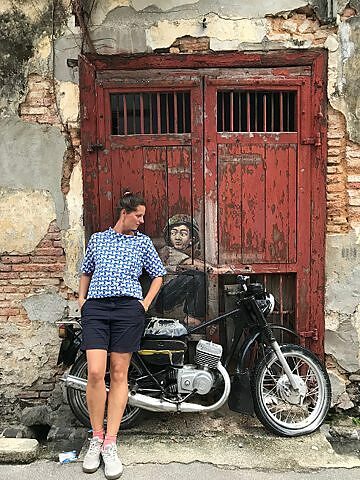 Her feature “Street Art in Penang/George Town” was published on October 19th 2018 by Deutschlandfunk Kultur Kompressor.